A perfectly ripened banana can put a smile on your face with its unique creamy quality and sweet, balanced flavour. 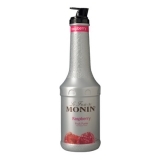 Carry-on perfection by using our Monin banana fruit puree in a 1 litre plastic bottle to prepare smoothies, milkshakes, cocktails, hot beverages and more. Monin Banana Fruit Puree delivers deliciously creamy and authentic banana flavor and texture to smoothies, milkshakes, cocktails, hot beverages and more. Fruity, ripe banana aroma; taste and texture of freshly pureed sweet bananas; highly concentrated. Banana puree, sugar, natural flavour, preservative agent: potassium sorbate, acidifying agent: tartaric acid (L(+)-), thickening agent: pectin. Contains 50.1% of banana puree.